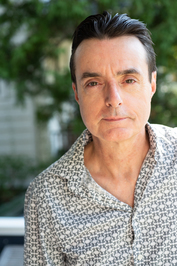 Mark Dery is a cultural critic, essayist, and book author who has taught at NYU and Yale. He coined the term “Afrofuturism,” popularized the concept of “culture jamming,” and has published widely, in the academic as well as the popular press, on American mythologies and pathologies. His books include Flame Wars (1994), a seminal anthology of writings on digital culture; Escape Velocity: Cyberculture at the End of the Century (1996), which has been translated into eight languages; The Pyrotechnic Insanitarium: American Culture on the Brink (1999), a study of cultural chaos in millennial America; and the essay collection, I Must Not Think Bad Thoughts: Drive-by Essays on American Dread, American Dreams (2012). His biography of Edward Gorey, Born to Be Posthumous: The Eccentric Life and Mysterious Genius of Edward Gorey, will be published by Little, Brown on November 6. Mark has taught in the Yale School of Art and the Department of Journalism at NYU and has been a Chancellor’s Distinguished Fellow at UC Irvine and a Visiting Scholar at the American Academy in Rome. Mark's latest book is the essay collection, I Must Not Think Bad Thoughts: Drive-By Essays on American Dread, American Dreams (University of Minnesota Press: April 2012). Bruce Sterling wrote the introduction; Boing Boing's advance praise calls it "...an intellectual journey through our darkest desires and strangest inclinations." Luc Sante says it's "a trustworthy and entertaining analysis of the lunatic fringe, which constitutes an ever-larger portion of the discourse in America today." To ask Mark Dery questions, please sign up. EDWARD GOREY: "OBSESSED WITH LANDSCAPE"
Gorey told the interviewer Simon Henwood that he was “really quite obsessed with landscape” but didn’t “know how to deal with it.” That's bosh. In _Born to Be Posthumous: The Eccentric Life and Mysterious Genius of Edward Gorey_ (pre-order now at https://books.google.com/books?id=hx6...), I take a close look at the landscapes in his work, pointing out just how beautifully handled they are. We’d love your help. Let us know what’s wrong with this preview of Bodies of Subversion by Margot Mifflin. We’d love your help. Let us know what’s wrong with this preview of The Blue Tattoo by Margot Mifflin.